Cancer is basically a cell that loses its normal mechanism of control and thus it grown in an unregulated manner. Lungs are pink sponges filling up the chest area. Lungs are divided into different sections called lobes. Oxygen is brought into the lungs, transferred to blood with the waste products like carbon dioxide being expelled in an efficient manner. 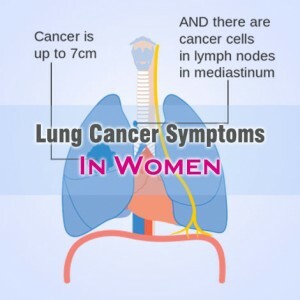 Lung cancer symptoms in women can greatly differ from lung cancer symptoms in men. This is due to the fact that the different varieties of lung cancer differ between the sexes and they have different signs and symptoms. Pain and swelling in the chest area is considered one of the most common lung cancer symptoms in women. These are symptoms that cause the patients to take immediate action. Shoulder and back pain are the other symptoms associated with lung cancer in women. Shoulder and back pain is usually caused due to the pressure exerted on the nerves because of the growing tumor. Shortness of breath which comes in gradually might be dismissed first as being inactivity or age but if it does not subside; steps need to be taken for proper diagnosis. Women with lung cancer might notice that they are suffering from breathing shortness while walking up and down the stairs. It is always very important to take notice of unusual feelings. This is because unusual feelings like getting tired easily and feeling exhausted without any reason can be taken as the symptom of lung cancer in women. The other miscellaneous lung cancer symptoms in women include intense and persistent coughing, hoarse voice, recurrent problems of the lung, pneumonia, loss of appetite, headaches, facial or neck swelling, general weakness, blood clots and bleeding. Great suggestive post indeed.. I was really unaware about the symptoms of lung cancer, you know. And therefore, reading this article was great beneficial for me to know better about the lung cancer. knowledge the symptoms of cancer among every people. Here you have listed the symptoms which can be easily to keep in mind for whole time. Thanks for your wonderful present for us..